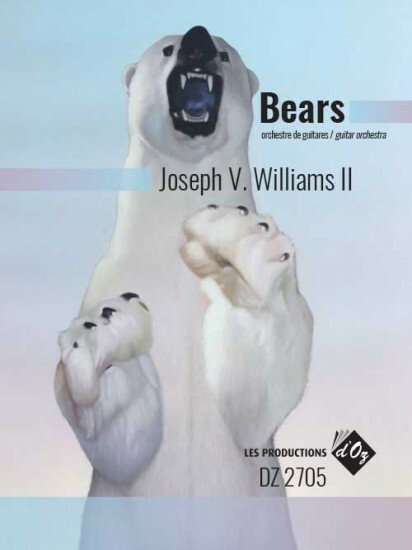 Composer: Williams II, Joseph V.
Why bears? These magnificent animals symbolize many things in our collective consciousness. They are perceived as sometimes soft and gentle, sometimes silly, and sometimes fiercely majestic. These perceptions are, or should be, tempered by the knowledge that they are powerful and un-tameable forces of nature. However, Bears is not from the human perspective or understanding of these animals. It is not what humans think about bears, but rather, what bears think about bears as they traverse the landscape of their domain. The previous version of this piece was premiered on March 11, 2011 at the Brownsville Guitar Festival & Competition by the University of Texas-Brownsville Advanced Guitar Ensemble directed by Michael Quantz. The present version was revised and completed in the summer of 2016.